Aquatic Access provides reliable and safe access to water activities for everyone. Meet the ADA requirements with a fixed lift that can be easily removed for storage. Powered by clean flowing water (no expensive and dangerous batteries or electricity required), these lifts are built to order from top-quality materials in the United States. Standard models lift up to 400 pounds, and custom bariatric units are available for greater lifting capacities. Inter-Fab Inc. offers a self-operable pool lift called the i-Lift™ to meet the new ADA requirements for commercial swimming pools and spas. The i-Lift™ is the only lift that offers a wireless remote control as a standard feature. The unit is battery-operated, with a low battery warning light and manual override switch, and delivers up to 90 lifts at maximum capacity on a single battery charge. The i-Lift is easy to install and can be removed without tools when not in use. Easy to install with four anchor bolts, S.R. Smith's multiLift™ is a flanged pool lift that can be right or left mounted. It is powered by the LiftOperator™ Intelligent Control and has a 350-pound lifting capacity. The Wheel-A-Way mobility option provides the flexibility to remove the lift if needed. Ideal for aquatic therapy and water exercise, the new Endless Pools 10-foot Exercise spa is a complete fitness and rehabilitation pool. The low-impact aquatic environment of the compact Spa is perfect for commercial or home installation. A post-workout massage courtesy of soothing hydrotherapy jets promotes and improves physical and mental well-being. Add a fully adjustable underwater treadmill to take the stylish acrylic Endless Pool Exercise Spa to the next level. Amramp makes life accessible. 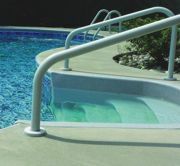 Amramp's wheelchair ramps, pool lifts and other accessibility products help people with limited mobility to maintain their independence and provide accessibility where they live, work and play. Amramp Modular Wheelchair Ramps are available to rent or buy. Products can be installed in days across the United States and include stair lifts, vertical platform lifts, patient lifts, portable showers and pool lifts. FABCOTE now offers its line of safety rails and ladders for aquatic facilities that wish to offer additional resources to swimmers with disabilities or are using swimming for rehabilitation purposes. The rails are available in both white and gray powder-coated colors. Fabcote's state-of-the-art in-house powder coating facility produces an exceptionally durable finish to resist corrosion in aquatic facility environments. All Fabcote rails are made of high-grade 304 stainless steel and are ideal for rehabilitation and disability access. Four compact lifts comprise the new line of AquaTRAM lifts: the AquaTRAM™LT, the AquaTRAM™, AquaTRAM™ 360 and the new portable AquaTRAM™ PT. All four units are battery operated with a 24-volt rechargeable battery that is more reliable and less expensive to install than typical water-powered units. Units come with a one-piece battery control box with emergency stop button for easier service and more security. 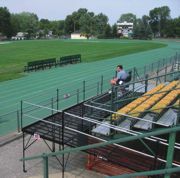 The units offer a 300-pound, 400-pound and 500-pound seating capacity. LifeGuard Lift's Power Lift Package #100287 is made in the USA and has a weight capacity of 350 pounds. It meets and exceeds ADA requirements. 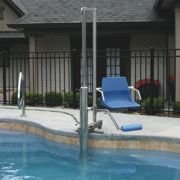 Made of high-strength aluminum, the lift features a marine-grade powder coating and a waterproof poly-coated actuator. The lift can be used for most scum gutter applications. The clinch pin design allows for simple disassembly and makes for easy storage. The package includes anchor, arm rests, safety belt and locking control box.